We understand how important your special day is and our talented, professional team will work with you to ensure every detail is carefully considered. With sweeping views of Thomson Bay & a choice of beachside spaces, Hotel Rottnest is the ideal setting for your wedding reception or special occasion. Let our events team guide you through the planning process, providing advice on room set-up and styling, to menu choices & accommodation for your guests. We will ensure your special day is a memorable one. The Governor’s dining room, cocktail bar & verandah is situated within the historic Governor’s residence building. The victorian tudor style room is tastefully appointed with high ceilings, polished floor boards & limestone walls, the perfect setting for a private wedding reception. Click to view the Governor’s Dining Experience Package. The small cocktail bar situated through a connecting door just adjacent to the dining room is a great place for your guests to mingle & have a few cocktails while you’re having memories captured around the island with your photographer. The Governor’s verandah seats up to 20 guests & is the ideal place to finish the evening looking out over Thomson Bay with a glass of bubbly. Allowing for up to 50 guests for a sit down reception with the ability to expand the space outside for extra seating, the Governor’s building and surrounds are versatile spaces suited to a range of dining options for your wedding day! We recommend the no hassle Governor’s Dining Experience for up to 22 guests, which is the ultimate in dining experiences on Rottnest Island. All you need to do is send the seating plan. The marquee lawn is just metres from the beach with dazzling uninterrupted views over Thomson Bay. The area can be utilised in three distinct spaces combining to make a large reserved area for up to 200 guests in a standup reception. The live cooking & bar station that services the area boasts over 10 metres of bar service area & can easily incorporate live outdoor cooking functions to serve your guests seafood paella! The area comes inclusive with a range of furniture options to suit standup or sit-down receptions as well as service from our staff for the duration of your reception & the option to include a sound-system for relaxed solo acoustic singer to provide the perfect ambiance to your perfect day. 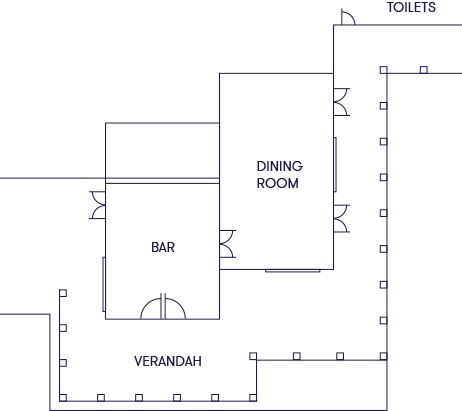 For larger groups, the island bar area south can be included* to allow you & your group even more space within our venue. When hiring this area is serviced by it’s own bar & a contains a selection of mixed high and low furniture. 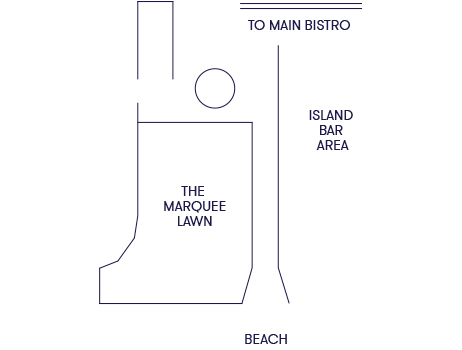 A versatile space allowing for Wedding Lawn Party options, sit-down dining experiences and even the option to include a marquee over the space, this area is the best space to enjoy views and the best food and beverage service available. We recommend the Lawn Party for up to 60 guests, an all inclusive option for Food, Beverage and Yard Games included. Options to include Live Music are also available. With some of Australia’s most beautiful landscapes & beaches, it’s clear to see why couples choose Rottnest Island to host their wedding. Get in touch with your Rottnest Island Wedding co-ordinator to book your island ceremony & let Hotel Rottnest take care of the reception. Lisa & Kane married with us in March 2015. Photo courtesy of Angie Simms Photography. Alicia & Tim married at Rottnest Island on the 2nd of April 2015. Photo Courtesy of Fields and Skies Photography. Aimee & Tim’s reception Hotel Rottnest – married on the 10th October 2015. Photo Courtesy of Objecktiv Wedding Photography. Our wedding brochure holds all the relevant information you should need when starting to plan your wedding reception with us. For any questions that we can’t answer please feel free to contact our Events Team. Ut wisi enim ad minim veniam, quis nostrud exerci tation ullamcorper suscipit lobortis nisl ut aliquip ex ea commodo consequat. Duis autem vel eum iriure dolor. Ut wisi enim ad minim veniam, quis nostrud exerci tation.